Baynes Sound is a hotspot for microplastics contamination. Research by Dr. J.J. Alava of Simon Fraser University shows Denman Island in a red zone. 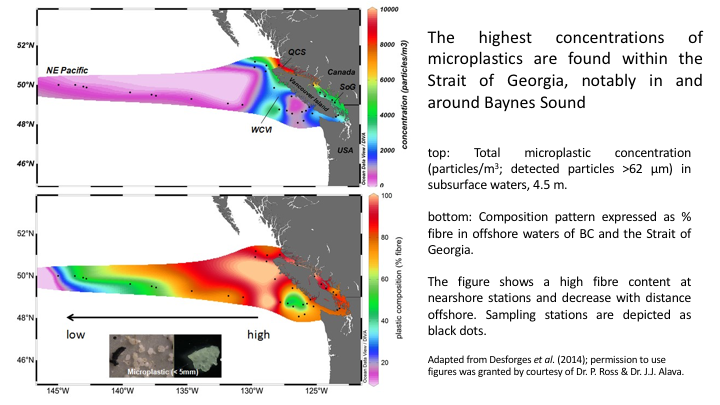 Currently in Baynes Sound, scientists have found 76,500 particles of plastic per cubic metre of substrate, and 4 - 5,000 particles per cubic metre in the water column. This illustration was created by Dr. Alava for ADIMS in 2015. When plastic disintegrates into microplastics, the particles absorb oil-based toxins from the water column. When microplastics are ingested, they release the toxins into the body, where they accumulate in body fat. 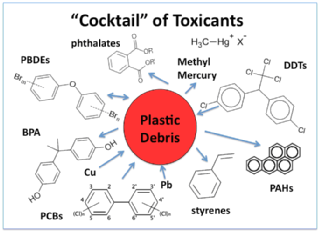 Many of these toxins are Persistent Organic Pollutants (POPs). POPs are toxic to both humans and wildlife. POPs bio-accumulate, or biomagnify; concentrations increase in the bodies of animals at higher levels in the food chain, with sometimes lethal effects. There are many other toxins, as the diagram shows. One class of toxins, the phthalates, disrupt the endocrine system, body processes regulated by hormones.